There’s nothing finer than a steaming plate of Italy’s finest coming at you from across the room, and Dino’s Bistro Italiano at Pearl Rotana Capital Centre does not disappoint. Whether you’re looking for the best fried mozzarella in the capital, or a new place to enjoy your quattro fromaggi, Dino’s is sure to fill your belly and (possibly) stain your shirt with sauce. Dino’s cosy trattoria interior makes it the kind of restaurant where you immediately feel like home – which we especially appreciate when we want to chow down on some Italian comfort food. 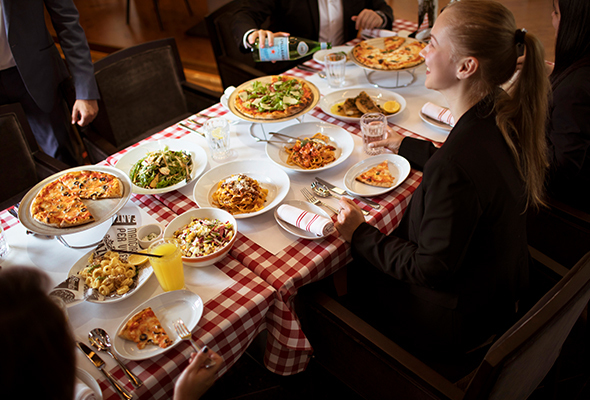 While it does offer a great selection of classic Italian appetisers like calamari fritti and cheesy bread, as well as some salads, pizza is really the way to go here. The menu is broken down by white pizzas and those with tomato sauce, and there’s plenty to choose from. Some of our favorites are the Calzone pizza, which is topped with tomato sauce, ricotta, mushrooms, spinach and mozzarella, or the tartufo, a simple pizza topped with cheese and white truffle oil. For the health-conscious, Dino’s also has a very popular vegan vegetarian pizza with eggplant, zucchini, mushrooms and more! Elsewhere on the menu you’ll find a selection of Italian classics from pasta to meat and fish dishes, all made from the finest and freshest ingredients. 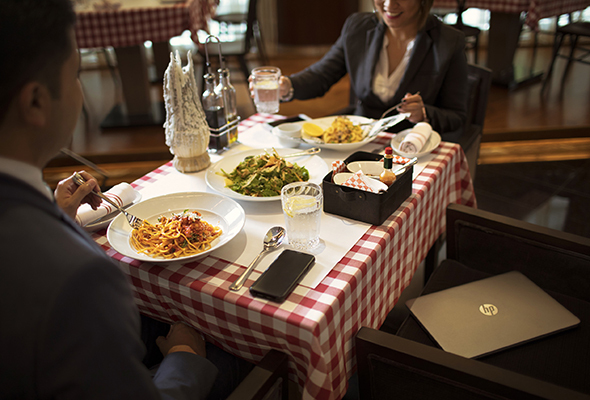 Great for a romantic dining experience or a weekend brunch, available every Friday and Saturday, Dino’s brings a true taste of Italy to the table. Check out Pearl Rotana’s Facebook page for more information.